Flash Friday is going all Impulse today. 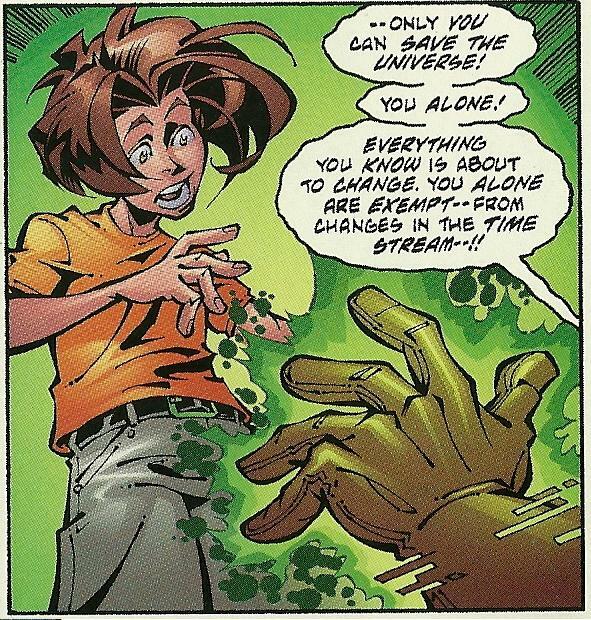 The last time I mentioned Flashpoint and all the crossovers I had made a mention that Kid Flash Lost has the opportunity to be really cool because of how time changes affect Bart. But I didn’t really go any further then that. 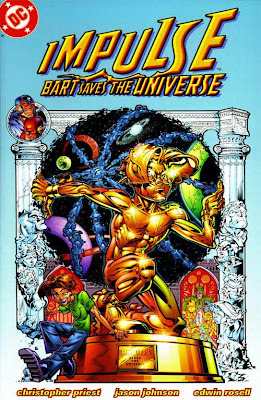 So today, we’re going to take an in depth look at one of the stories that explains how time changes affect him; that book is Impulse: Bart Saves the Universe. This is going to be a long one, so check out all the Impulse-y goodness after the jump. Before I get to the story let me talk a little about the book. Released in March of 99 it was written by Christopher Priest. Pencils are done by Jason Johnson, Edwin Rosell did the inks and colors, and Willie Schubert was the letterer. It was a prestige format book, so it has the card stock cover, a higher page count, and cost 5.95 when it came out. For those of you looking to pick up a copy, I think it is easily found for less then its cover price now. The story starts with Extant wiping the floor with the JSA and Max Mercury rushing in to try to stop what is happening. The Linear Men show up to handle the issue the way they think is best. Max calls out to them that it is a trap but no one hears him. We then jump to Bart and Carol in the Flash museum. If you weren’t an Impulse reader Carol was one of the few people who knew Bart’s secret identity and was eventually turned into a love interest. She hasn’t been seen in a long time and the character is missed. Moving on. 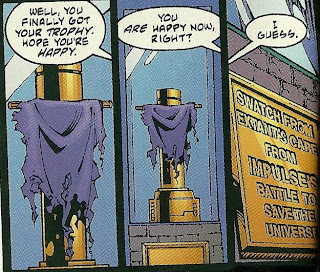 Bart is complaining that there isn’t really anything in his room of the Flash museum when one of the Linear Men appears and tells Bart that he is the only one that can save the universe. He then disappears, leaving one of the displays in the museum destroyed. In his desire to do something great and get noticed Bart had been bugging all the other members of the Justice League. Between that and the wrecked exhibit, Wally shows up at the house to lay into Bart. If that sounds out of character for Wally you have to understand that he and Bart did not start off as the best of friends. Max is the only one who believes Bart saw someone teleport in the Flash museum, but he still sends Bart to his room for harassing the other League members. When Bart awakes everything in the house has changed and he walks in on a woman shaving her legs. With Max and Helen missing he immediately goes to Carol only to find out that she has no idea who he is. Max is gone, Carol doesn’t know him, and so the next place Bart runs to is Wally’s house. Wally of course isn’t the Flash in this new reality and doesn’t really know what to do with this costumed kid. Then Bart mentions his last name is Allen and in a surreal jump in logic Wally decides to take the kid to his uncle Barry. 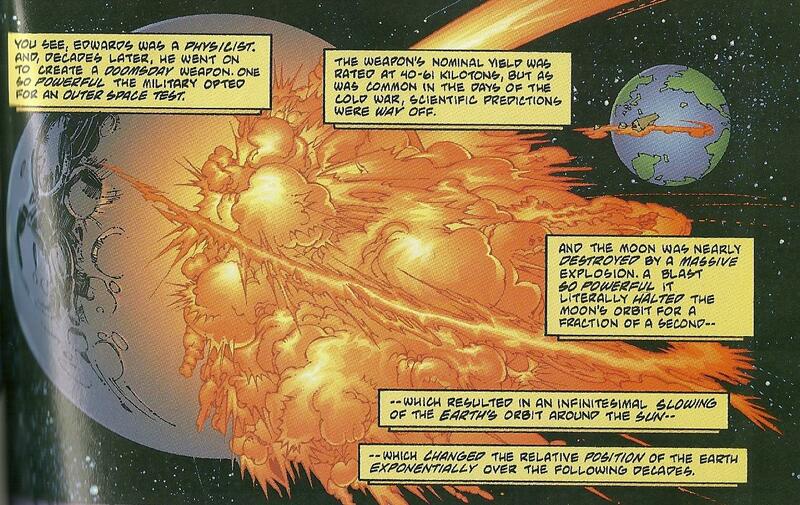 Now this isn’t today’s DCU, Barry Allen was dead, dead, dead at the time. So they go to Barry’s and he believes Bart’s story. There is also a cute bit here where Barry and Wally don’t understand how they can both be the Flash in Bart’s reality. Anyway, a dying Max shows up and explains all of time changed because Extant tricked the Linear Men into saving a man named Garnet Edwards. Edwards was supposed to die, him being a live changed everything. 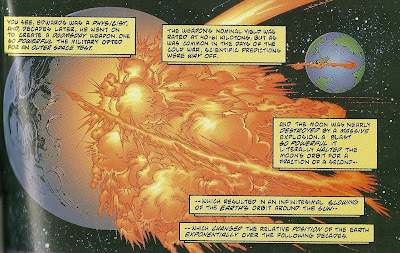 Exploding moons would normally cause people to wield sun swords and hang around with moks, but in this case it did things like make Abin Sur never reach Earth and Barry Allen arrive too late to get struck by lighting. And finally we get to the reason that Bart is immune to the time changes. Basically Bart’s backstory is so full of time travel that it takes a long time for changes in the time stream to catch up to him. The latter part of that is what makes it interesting to me. He isn’t completely immune to changes in the time stream. That means if Kid Flash lost does play with this concept he may be pulling some Marty McFly stuff and may slowly start fading away while playing guitar at his parent’s prom. Well, probably not the prom stuff but you never know. Then we have a bit of a downer as this Max dies and Barry teams with Bart to help him out. Barry is excited to know that if Bart succeds that Barry will eventually become the Flash. So Bart is depressed again knowing that Barry will die. 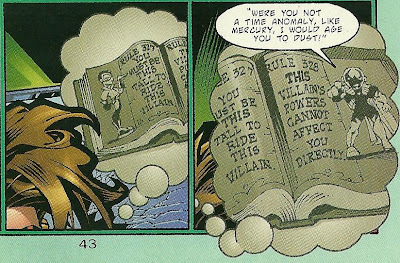 Bart eventually goes into the past and is spying on the JSA. He runs into a younger Max Mercury who is also spying on what is going on. Once Max believes that Bart knows an old version of himself Max does a great Doc Brown impersonation about not wanting to know the future and such. Extant does show up and while he can use his time powers to cancel Bart’s speed, he finds that he can’t directly affect Bart with them. Using that knowledge Bart takes out extant, mainly by using his cape to trip him. I guess Edna Mode knew what she was talking about after all. 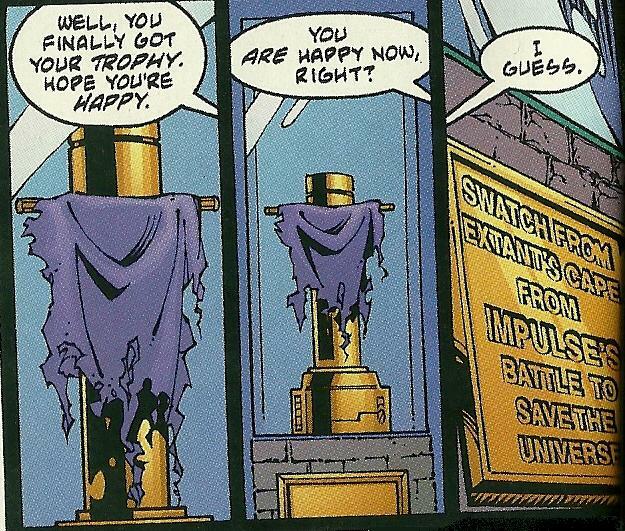 With Extant defeated everything reverts back to normal and Bart finally gets a trophy in the Flash museum. He goes on to say that there are things he wishes he could have done better when fighting Extant, so it ends with a One to Grow On type message. So there you have it, one of the two big stories where Bart being a time anomaly comes into play. The other has to do with Linda Park being pulled out of the timeline. If there is a lot of interest in that I’ll start diving into my back issues, pulling the prestige book off my shelf was much easier. As a side note, I ran out of spots in the article to put pictures, but this panel is too good not to show off! Just consider it a bonus. See you next week. I remember the Linda Park being removed from the timeline thing and the emergence of Walter West as the Flash. I loved that costume but thought that story-arc itself could have been written much better than it was. The best parts imho were Walter's interactions with Bart. Great post, yet also very sad. 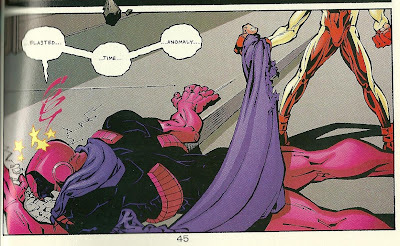 One of the reasons why I both love and hate going back and reading old Impulse back issues; I love the stories but looking at Bart now, and all the crap he has gone through since this and it is just gah! If only they hadn't tried to rush The Flash thing, and cancelled Young Justice. It is kind of cool how his convoluted origins are almost like a super power though. I loved drawing this book, it was so fun. Glad you liked it! Jason, the book is still one of my favorites because it was so over the top fun! I'm glad you found the write up.